Despite Syracuse slipping from a surefire one seed in the east region in the NCAA Tournament to a three seed in the south region, Syracuse coach Jim Boeheim expressed optimism about his team’s chances. The Orange will play Thursday against Western Michigan in Buffalo, NY, at 2:45 p.m.
Boeheim downplayed the location being so close to Syracuse. After starting the season 25-0, Syracuse lost four of five games, and then lost in its first game in the ACC Tournament. Still, Boeheim said he was happy with 27 wins and his defense, which has been key to those wins this season. That has not been the case for the offense, which didn’t break 70 points for nearly six weeks after a 91-89 win over Duke on Feb. 1. The Orange again struggled in the ACC Tournament, shooting 32 percent in a 66-63 loss to North Carolina State. 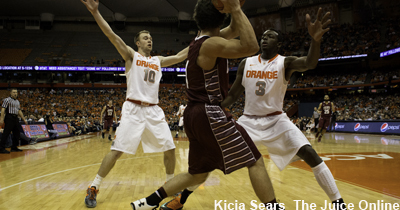 Still, Syracuse’s win against Florida State game was a better showing on offense for the Orange. Boeheim acknowledged losing Jerami Grant was a huge factor in some of the team’s losses. With a lot of good players, the team needs balance to succeed. 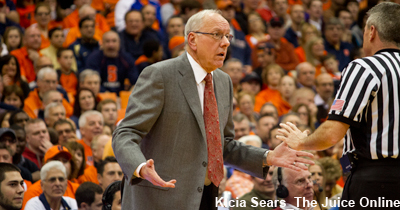 Boeheim wasn’t bothered by SU’s loss to NC State in the ACC tournament. As for the bracket, Boeheim had no complaints in what he saw. Michelle is currently studying Public Relations at Syracuse University. She is a part of disability student advocacy groups among other clubs on campus, and currently works for the University’s Literacy corps. Michelle is from the D.C Area, and though home means facing Georgetown fans everyday, she still remains loyal to the Orange. 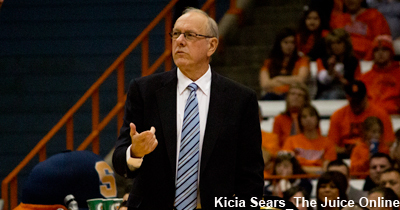 She has followed Syracuse Athletics with her father since elementary school. Follow her on Twitter @michelle_sagan.